Philip’s mom had mentioned that she would like some cookies to take the to church’s annual Christmas ladies’ luncheon. Among these ladies are many, many of the folks who have supported both Philip and me in our travels and endeavors since joining the Air Force. These ladies even threw one of my baby showers when I was pregnant with A.J. years ago, and I have remained in contact with many of them, through pictures, letters, and annual Christmas cards. 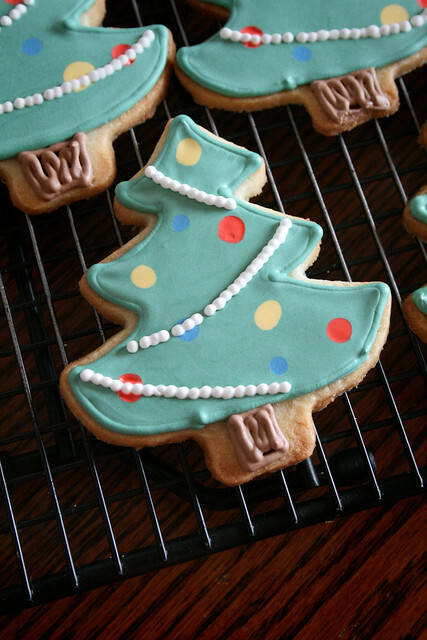 I woke up one morning in early December with a start: when were the cookies due again? Philip checked with his mom – five days away! 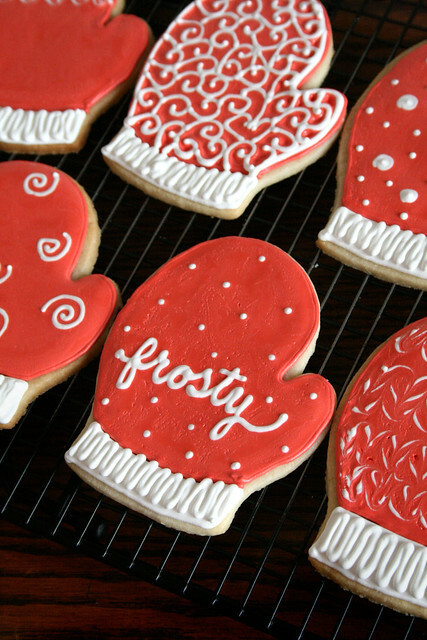 They needed to be baked, decorated, dried, packaged, shipped to West Virginia, and arrived in just five days! Eep! I lit a fire under my own rear and got flying! 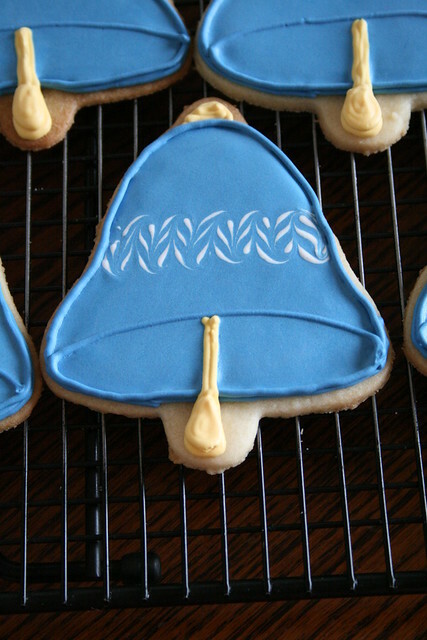 Cookies for the SCBC Ladies’ Luncheon. 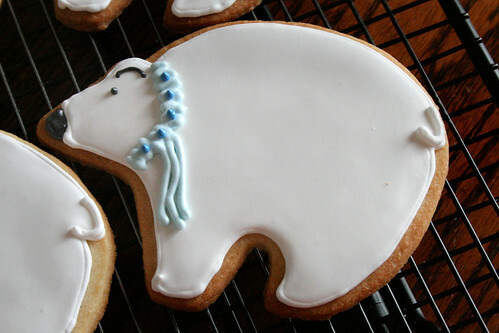 Among the cookies, I had found an adorable cookie cutter at my local gourmet shop: a big polar bear! In my mind, he would make the cutest little winter guy, and I knew that he would be perfect for Nancy. She and Philip’s dad had visited us in Alaska, and they loved seeing the special animals in the cold climates… like polar bears! 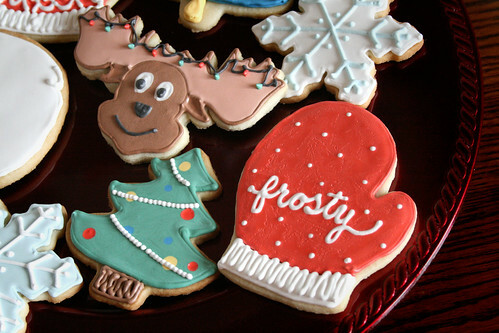 I changed my icing on the cookie to give him a little nub of a tail – too cute! And there were others, too! 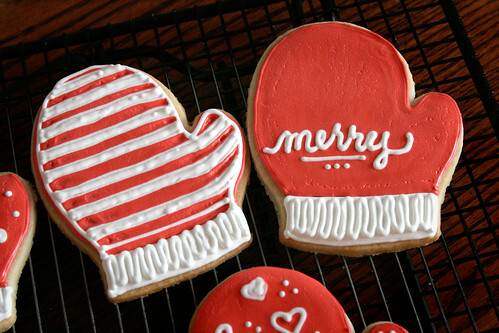 I had a lot of fun making these cute cookies, even in all the rush. The bonus was that the cookies were shipped on Thursday afternoon from us in North Dakota, yet they still arrived in West Virginia by Saturday morning – in plenty of time! 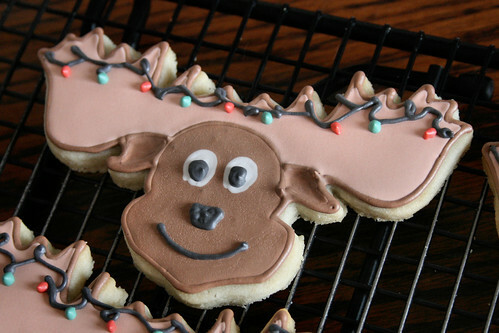 The “Merry Moose” was another idea I had while browsing the local shop. Philip’s parents had several moose experiences in Alaska, and I knew she’d get a kick out of a charming little moose with Christmas lights in his antlers! 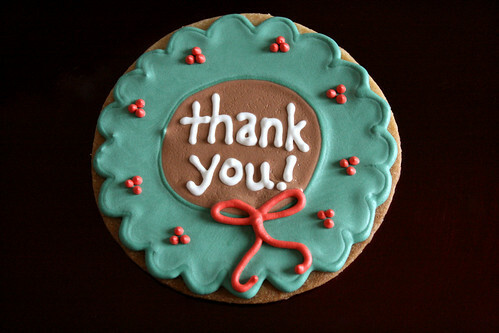 As always, I made a coordinating Thank-You cookie to go with Nancy’s order. I loved how this little wreath cookie turned out – cute! After all those successes, of course something had to go wrong. No, the cookies didn’t arrive broken, but… the luncheon was snowed out in Bridgeport! Still, Nancy saved the day, visiting all the ladies on her own and delivering the cookies to those that would have been in attendance. She also passed on extras to shut-ins in the church. I’ve heard from several in Christmas cards this month, and it sounds like they were a hit! 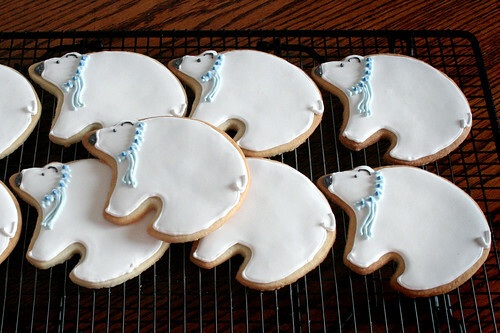 I LOVE THE POLAR BEAR!! 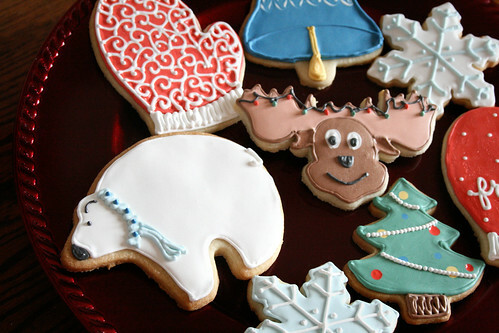 All the cookies are beautiful – seriously, you have SKILLS! 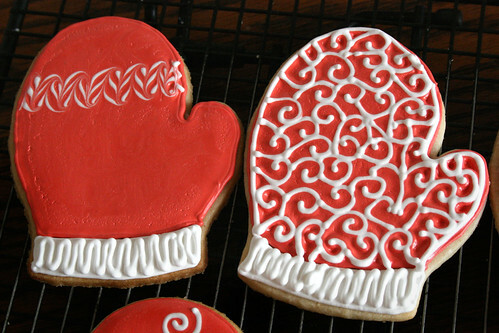 But the mittens and polar bears are my favorites! Well done and bravo, you! 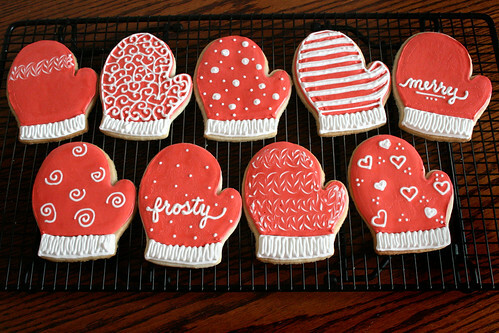 Could you freeze cookies like these? 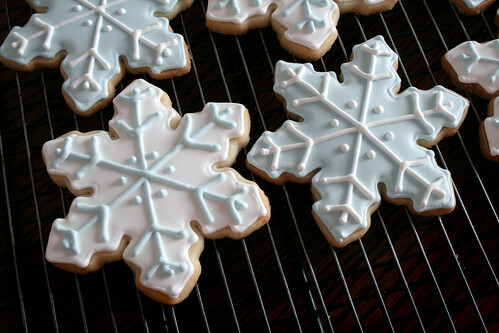 I’m looking to make snowflake cookies this winter (something spiced with just piping on the surface) and would love to make them in advance. You seem to be an expert so hope you don’t mind me asking? Chelsie, you certainly can freeze them! I seal them individually in bags, but even if you don’t do that, you can freeze them. Just package them inside freezer-save ziploc bags, and then put the bags inside a Tupperware or ice cream container & freeze (up to 2 months or so). When you are ready to serve them, take the entire container from the freezer about 4 hours before. Make sure the ziploc bags are ROOM TEMPERATURE to the touch before opening, as you don’t want any condensation to form on the cookies. Ta-da! Beautiful work but pls may I know how you make the sugar dough? Welcome to Life’s a Batch! I’m Nicole, and I’m glad you’ve stopped by my little corner of the web! I’m a former Air Force wife whose passions are baking, cookie-making, and photo-taking… all to the benefit of my loves – my family! C’mon in to…read more. Powered by WordPress. Design by flyawaypixels.